The new HUAWEI indictments make include some amount of comedy. The basic claim centers on an anthropomorphic robot named “Tappy.” Tappy is owned by T-Mobile, but HUAWEI was allowed to use Tappy to test phones it was making for T-Mobile (subject to a non-disclosure agreement). HUAWEI then started developing its own robot — with the much less friendly name of xDeviceRobot. HUAWEI tried to buy Tappy, but was refused and so figured out a way to infuse xDeviceRobot with some of Tappy’s features. That infusion of ideas is what los federales consider criminal theft of a trade secret in violation of the Federal Economic Espionage Act. 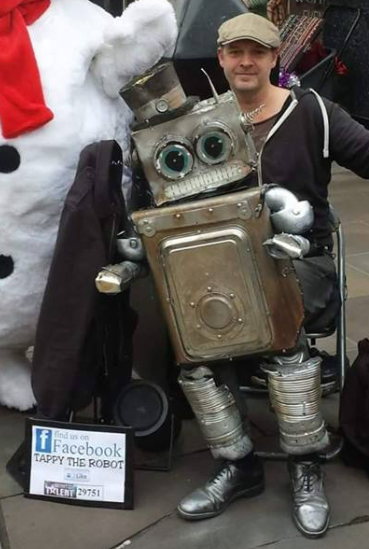 I’ll note here that Tappy the Robot is also a street performer with its (his?) own FaceBook page. I might suggest a dance-off to settle the dispute. It turns out that HUAWEI perhaps didn’t take all the steps necessary for criminal trade secret theft. But, the criminal prosecutors were able to indict the company on conspiracy to steal trade secrets and attempted trade secret theft; as well as wire fraud and obstruction of justice. Still waiting Malcolm (noting that you appear to have all the time in the world to do your usual same C R P on the newer threads…. Noting here that Malcolm has now played the exact game to which I called him out for here (and to which he has merely run away) on at least two more recent threads — to the exact same effect. Wouldn’t it be nice if he had to actually abide by such counter points presented and NOT engage in his asinine Drive-By Monologue Internet Style Shoutdown routine? The moral of the story is not to share confidential information with a Chinese technology company, even if under an NDA. Your answer of “even under an NDA” is not a viable answer and instead, enforcement under the law should be swift and certain in order to provide the benefits that NDA’s were created to foster. Being a doctor that merely says “Don’t do that.” is rather a joke of an answer, eh? Not the joke, and not the point of the joke. That you think yours may be a better fit is not a good indication of your grasp of the situation here. Economic espionage by a Chinese (spy) company that poses a security risk to the West hardly seems the basis of a joke. No Charlie Brown. There’s a binding contract. Its fine. Go ahead. Kick the football. That’s humorous Les, and perhaps apropos (given the nature of repeat offenses), but see also the ill-effects [ ] of taking the medical advice of “don’t do that” per post 8.1 above. I don’t think anyone is disputing that the NDAs should be enforced. Nevertheless, if your car is missing and you explain to the police that you parked it in the shady side of town with the keys in the ignition, doors unlock and engine running, its as likely they will charge you with insurance fraud as it is they will hunt for your car. Is that supposed to be some sort of “objective” reference to ANY type of NDA agreement…? Your example is a rather pitiful strawman with no relation to the point under discussion. No. Try to keep up. The law making it a crime to steal a car is the analog to the NDA. Handing your tech to the Chinese and expecting the law to protect you is analogous to the part you quoted. Except YOU keep up – your degradation of NDA down to the level of “shady side of town with the keys in the ignition, doors unlock and engine running” is simply NOT appropriate for NDAs. The law making it a crime to steal a car is the analog to the NDA. Your example is NOT drawing a parallel from the law making it a crime to steal to the NDA. Your example is diminishing the NDA to the point that YOU would be investigated for insurance fraud. Maybe you mean to say something else (but you have not said that yet). You’re being obtuse, as per usual. I am not being obtuse at all. Your post is wrong. I explained why. Do you know what obtuse means? I agree. It isn’t a joke. I think treating IP like it is a joke is part of the anti-patent narrative. As in they didn’t really steal anything because there wasn’t anything to steal. It comes down to treating the wide open gate of 101 in an inte11ectually honest manner. These are meant to be low bars. These are not meant to be a nuclear option against entire types of innovation. It simply is not up to the courts to declare that certain types of innovation are to be kept out of the patent system. That application may manifest itself in one or more statutory categories. And it is important to recognize that AN innovation may be portrayed in multiple categories. In fact, this is a critical element in patent law to understand. Why is that? It is so because this informs the context of innovation as spanning (hence being more than) any ONE single category. Paul Cole has opined that the sets of true “Abstract” and the statutory categories are non-intersecting sets. While indeed noble and elegant in theory, anyone with any sense of objectivity would immediately recognize that the Supreme Court’s practice does not rise to that noble and elegant theory. The Court has chosen (for its own “policy” reasons) to go in the opposite direction of the intent of Congress, in disregard of the actuality that an innovation may be “more than” one single category. Additionally, the notion that AN application of an innovation may well in its essence span multiple categories draws upon the other part of 101 as its guidance. If AN application (the multi-statutory-category-spanning application) is only weakly constrained to be presented in at least one (and one per claim) statutory category, the co-driver — and the Congress-chosen policy driver — is one of utility. And in the US Sovereign, that choice of utility is the broader than ‘technical arts’ choice of the Useful Arts. The Scrivining is the Court has attached itself as “exceptions” to the statutory category portion of 101, when in actuality, the “exception” of (at least) “Abstract” is more directly tied to the utility portion of 101. This should be structurally recognized by the intended aspects of protection flowing from the Constitutional grant of authority to the Legislatice branch (the split of protecting expressive aspects in Copyright law and protecting utilitarian aspects in Patent law). The problem (one of the problems) for the Court is that their desired policy is NOT in accord with the actual words of Congress, and innovations that they would deem unworthy of patent protection may EASILY meet first the statutory category, but also, would meet the utility prong of 101.
Business (most all business) has always had aspects that speak to a utilitarian nature. Sure, there are businesses OF things wherein the “subset” of the “OF” may not be utilitarian (huge business ($$$$) in sports and entertainment); but one should not confuse and conflate the “OF” with the aspects of business itself. More than one aspect may be in play, and admiration of expressive aspects in the “OF” subset do NOT constrain the actual presence of aspects of utilitarian nature. It speaks to the (inappropriate) “rarefied” egalitarian disdain of such “sullying” of that which the Court would prefer their “policy” of reservation for items that possess some Flash of Genius (no matter if Congress expressly said otherwise). This reasoning is bankrupt for well-known reasons (e.g., books with new text written on them are not eligible for patenting, even though the book is not “purely abstract”. The problem is that the claim to such a book nevertheless protects the abstraction in the context of prior art books. That is the problem that the Court has addressed, in a very reasonable holding that is never going to be changed). Most people can understand this. Many other not terribly intelligent people (like Billy and his hero, Big Jeans, struggle with it). LOL Who gives a sh it what Paul Cole thinks about anything? That’s conflation of the two prongs – which is exactly the point that I present. Once again, you post something that in essence says that I am correct (even if you cannot see or understand it). Not so. Remove the canard of your “book” attempt, and your position falls apart. Much like how you merely “mouth” First Amendment, yet have never provided an actual and cogent First Amendment argument (hint: crying out “First Amendment” is NOT an actual and cogent First Amendment argument). Yet again you show your odd obsess10n with Quinn. And once again, you ignore the plain fact that the courts have written (scrivined) themselves into a Gordian Knot of contradictions (contradictions that directly flow from the “I know it when I see it” Supreme Court nonsense). So “grown up” of you. About as “grown up” as Trump. Just about the same. In Russia, robot taps you. According to magic boy, MM, there is no structure to perform the functions anyway, so there is nothing to steal. All the functions that are performed are magically performed in the ether in a spirit world. At least that is what MM believes. … or that machines really do think — and do so in that same magical aether. Of course, this distinction at the heart of the matter was long ago succinctly captured and presented (in short declarative English sentences even) in the Grand Hall experiment. It is no surprise that Malcolm has refused to engage that experiment and instead has repeatedly chosen to v0m1t his typical inappropriate ad hominem, deflections, and dissemblings. At least that is what MM believes. And Night Wiper believes that he and “anon” should be free to r@ pe young children. They believe that very deeply and strongly. How do I know this? Because I say that I know it. Which is apparently all that is needed in their world. OK magic boy. Keep telling us about this new type of structure that is tougher and stronger and more real than the structure of computers. Keep telling that there is no functional claiming in the chemical arts. Apparently, you are projecting again – as this is completely made up — by you. Your number one meme is also the most stale meme. Accuse Others does not f001 anyone (except maybe you, but you f001ing you is most definitely a YOU problem). What anon said is correct, MM. The only thing I did was repeat what you say over and over again. You just fabricated nonsense. And not only did you fabricate nonsense, but you won’t defend your bizarre science claims regarding such things as functions without structure. He won’t defend because he cannot defend. He cannot defend because that would defy reality (see the Grand Hall experiment). He also cannot defend (even if reality were not to be defied) because he lacks the brains and willpower to formulate a cognitive argument that not only acknowledges counterpoints presented, but integrates them into the continuing discussion, and instead retreats to his only refuse afforded his feelings, that of mindless ad hominem, deflections, and projections. This is not a new condition for Malcolm, even as it has been a driver for him to continue his blight over the last MANY years. Mindless ad hominem that misses the mark and does not address any point provided. Please do as already suggested and spend less time with your empty insults and more time actually trying to engage in at least some meaningful and inte11ectually honest manner. Turn a page for entering into your 15th year. Except you do believe in child r@ ping, “anon.” You’ve said so a million times. So has Night Wiper. It’s your most important belief and it drives all of your behavior here and elsewhere. Next time you and Night Wiper are discussing the awesomeness of child r@ ping, please deliver your hypocritical lecture on “empty insults” to Night Wiper. Or you two can keep je r king yourselves off about alleged positions of mine that I not only have never held, but which I have in fact expressly repudiated hundreds of times, you incredibly st 0 0 pit f cksticks. These comments from MM are why you should ban him or limit him to one comment per thread. I would prefer a mechanism that constrains his “one comment” a bit differently. then the offending post be either*** expunged or moved to a side portion of the site (sort of like what DISQUS provided, as a collection of posts by each entity — which would show just what a blight Malcolm is by concentrating his cognitive dissonance). Generally speaking, “count filters” are a bigger nuisance than they are a help, as they do NOT constrain the mindless drive-by ad hominem and they DO constrain actual back and forth dialogue. I “get” that the “count filter” is an easy way out – set and forget – and that expunging takes more time (and worth noting, Malcolm has had more posts expunged than anyone else – Malcolm has had more posts expunged than everyone else combined). And only Malcolm has shown a repeated utter disregard for “rules” (his ego placing him beyond the rules, even as he loves to go “off-patent” in his rants about those he feels disregard HIS “rules”). ***I would also note that other blogs have active editorial controls that effectively control such nonsense, one of which also happens to be a blog run by a person (Quinn) that Malcolm 0bsesses about. I would also note that this is in line with my personal advice given to the editors of this blog some five or so years ago when there was a “let’s have a nice ecosystem” push. As Malcolm now enters into his 15th year, maybe, just maybe that ‘effort’ (either by Malcolm or by the editors here) will show some meaningful results. Who knows, actual on-point patent law dialogue may be promoted. A dance off will do it. I feel like I’ve heard that word somewhere before. It’s an awesome word – and directly ties into the Mental Steps doctrine of patent law (as that doctrine rose — and fell (and would impact the current attempts at Zombie reanimation). Great story about Tappy on NPR’s Morning Edition today. Just to be sure, did the events in question take place BEFORE or AFTER there was a federal trade secrets act? Surely the Feds couldn’t be so, er, eager as to overlook something as basic as whether or not an alleged behavior was criminal at the time it allegedly occurred. The Federal Espionage Act predates the newer Federal cause of action from the Trade Secret specific legislation.